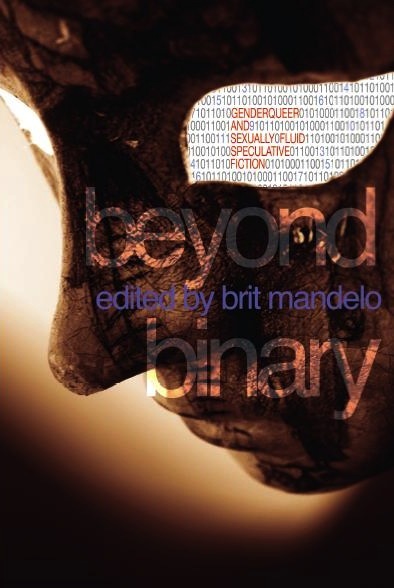 This is a long, conversational interview with Brit Mandelo, editor of Beyond Binary: Genderqueer and sexually fluid speculative fiction (Lethe Press, April 2012), in which we approach the book in terms of editorial approach, work process, content, publishing, and community. It starts with a lengthy introduction then moves onto questions, which continue in Part 2 and Part 3. Seventeen stories of genderqueer and sexually fluid people living, laughing, lusting and lying their way through the world. Seventeen points of light burning like beacons above the plain of “normal.” Seventeen tales written mostly in the twenty-first century about the future, the past that never was, and alternate universes that might never be (or always have been). Seventeen authors working on the bow wave of their own writing, riding a surge of inspiration. These writers–the vast majority identify as female, a thrill all of its own–play with many versions of queer. The stories range from a 35-page novelette that begins at the raw edge of loneliness and ends in exuberant human connection, to a 6-page blink of quantum weirdness encompassing all possibilities. The stories teem with gay, trans, lesbian, bi, polyamorous, asexual, unspecified, and imaginary people–as well as aliens, angels, and androids. But each ends with some oh-so-human satisfaction, resolution, or glad understanding. Beyond Binary is peopled by those who are brave, who say Yes to joy–and not only survive but thrive. Some of these pieces are truly strange. Some are delicious romps. But in the end this is the rarest of anthologies: the sum is greater than its parts. Read it. Read it all. Why so long? Because I want this book to reach its readers. It matters. We need to see ourselves reflected in the stories we read. It can even save lives. Reading the book brought back memories of editing the BENDING THE LANDSCAPE series of all-original short fiction with queer protagonists. I started the project in the mid-nineties. The first volume, Fantasy, was published in 1997, the second, Science Fiction, in 1999, and the third and final volume, Horror, in 2000. It was a huge amount of work, with lots of attendant frustration, but in the end it brought me a vast heaping of satisfaction and a hot current of joy. It was absolutely worth it; I still get email about it from readers. The books won various honours and–just as importantly to me–individual stories were nominated for a host of awards for their authors. I had multiple aims with BtL: to get litfic writers to dip their toes into speculative fiction, to get straight writers to try their hand at queer characters, and to ensure an even gender balance…all while curating three volumes of great-to-read fiction. Multiple aims, of course, is insane ideal for a brand-new editor, but, well, I simply wouldn’t listen to wiser heads. I was convinced I could do it all. It took five years to produce three books, thousands of hours of brute work. (I lost one of my favourite stories, from Brian Aldiss, early on in the process, due to publishing problems. It was published in Interzone.) It wasn’t easy figuring out how to work with my co-editor, Stephen Pagel, on such a big project (though in the end we worked together beautifully; we worked out a seventy-percent consensus rule). Or to move from one publisher to another mid-stream. Or plough through the tsumani of earnest, often terrible submissions whose theme seemed to be: love conquers all (even gravity and lack of oxygen). I had to say no, over and over, to hopeful new writers, and it’s hard work breaking hearts. Also, the cherry on top of the awful pie, I didn’t really make any money–because of the publishing change mid-stream I ended up passing much of my fee along to the authors. The whole experience was so exhausting, in fact, that although I’ve been approached to edit anthologies several times since, I’ve always said no. But I’ve been thinking for a few years now that we desperately need more speculative fiction anthologies with quiltbag writers and/or characters and/or themes. A couple of a times I’ve come close to biting the bullet. But, hey, now there’s Beyond Binary. I’m thrilled: I won’t have to do it! So I’m grateful to Brit. Brit, describe to me in your own words why you took on this project, what you hoped to achieve, and how it felt to put it together. I took on this project because I wanted there to be a book that collected genderqueer and sexually fluid stories in one place and made them available to a larger audience of readers. I wanted to read a book like that. I wanted to have had a book like that when I was a teen, when I was seeking narratives to explain my own identity, to deal with how I didn’t quite fit into the binary boxes available to me both in the heteronormative world and, often, in the predominantly lesbian and gay community I was part of at the time. The sense of not-fitting, of having to reduce or ignore vital parts of myself to fit those boxes, was a constant pressure. Finding the words and stories to explore non-binary identities was a beautiful thing for me, when it happened, and with Beyond Binary I hoped to provide a book for the people who need it, now, like I needed it then. That’s part of why I tried to choose stories that encompassed different sorts of identities under the bigger umbrellas of genderqueer and sexually fluid. There are trans* stories, bisexual stories, asexual stories, gender-neutral stories, gender-fluid stories, stories about the gendering of bodies, and a lot in between. I hoped to capture a small corner, at least, of the big tapestry that is “non-binary identities,” and also to include intersectional stories, too. So, really, what I hoped to achieve was to create a book that spoke to people. I hoped to foreground these great genderqueer and sexually fluid stories for the audience that was seeking them—and for people who might not know they were seeking them, too. I wanted to help lighten a little bit of darkness in the larger conversation about gender and sexuality, when it comes to non-binary identities; I wanted to amplify and draw attention to these so-often silenced dialogues of self. The power of storytelling is a big, big power; the power of being made real in words and text is something that feminist and queer theorists have been talking about since before I was born. I hoped to contribute to that. Putting together the project was an emotional and fulfilling experience, only made more so by the reception of the book. It was difficult, too—I worried constantly about balancing narratives and voices in the book, about missing stories, about still-silenced voices, about potential erasures I might be unintentionally contributing to—but the difficulty and stress were absolutely worth it. I felt while reading for and arranging the project that I was doing something worthwhile, something valuable and potentially good. It was personally satisfying—as I said, I would have loved to have had a book like this, years ago—and very emotional. It prompted me to talk more publically about my identities, also, which was fraught with discomfort but ultimately a great relief. (I’d come out as queer years ago, but discussing my gender identity had remained a very private and personal thing.) The responses and the positive support the book has received have been overwhelming, and I’m glad that at least a portion of what I was trying to do seems to have been successful. You were very smart to go with reprints for your first book project. Did you do any editing at all? Would you like to in the future? I did a little minor, cosmetic editing in some cases, but didn’t get elbow-deep into any of the stories. Because I was reading for reprints, I looked for pieces that stood out to me “as-is.” There were stories I came across in the reading process that, had I been doing hands-on editing, I might have suggested revisions for; instead, I had to let them go. After that, I definitely wanted to work with original stories and more in-depth editing in the future. And, serendipitously, I was offered the position of fiction editor at Strange Horizons early this year, so I’m now getting to do that hands-on work. It’s great! I’m glad to have the opportunity to continue working as an editor, and this time for one of my favorite magazines—plus, there seems to be a really nice continuity there, since there are two reprints originally published at Strange Horizons in Beyond Binary. Right now I’m thinking there needs to be a companion volume of older stories: so we can see where today’s work is coming from. And of course I have ideas about that. But tell me what you think. I think that would be brilliant. There’s a history in speculative fiction of stories that explore spectrums of gender and sexuality, many of those written before there were words or frameworks to easily do so with. I could think of a few stories straight away that I didn’t or couldn’t include in Beyond Binary, like Joanna Russ’s “The Mystery of the Young Gentleman.” Getting reprint rights for things can be tricky, though. There are some great Ursula K. Le Guin stories that I would have liked to have included, too. And in the case of an ideal companion volume, I think I’d also like to include novel excerpts; there are so many books that were dealing really intimately with issues of sexual fluidity and gender, like Marge Piercy’s Woman on the Edge of Time. That novel had a lovely third-person pronoun, “per,” that I wish would pick up greater usage today. And I’m sure there are much older stories, too—I’d love to be set loose in a good research library to seek them out. Very interesting piece. As a teen I would have loved to read this kind of books. Interesting to read more about Beyond Binary as well as get some illumination into an editor's trials. Feel compelled to read the collection now. Thanks for the interview, this is great! Being a contributor in Beyond Binary was a huge honour & I hope the older reprint book can happen. I discovered the Women of Wonder books at exactly the right time to educate myself about women in the field and it would be brilliant to have equivalent QUILTBAG books. I really liked “Prosperine When It Sizzles,” which was new to me. I think Pamela Sargent did a great job with WoW. It's definitely time for the quiltbag equivalent.